Also Known As: "Arnoul (St Arnoul) "de Heristal" Bishop of Metz", "Arnulf"
Arnulf (or Arnoul), Bishop of Metz. Venerated in Roman Catholic Church Feast July 18, Patron Saint of beer brewing, Stammvater und Hausheiliger der Karolinger. His ancestry is uncertain. He was probably son of Bodegisel II and his wife Oda, but experts disagree. Kelley (1947) investigated the connection of Charlemagne to Syagrius in detail. He used a 9th century pedigree of Charlemagne, but rejected its clearly incorrect claim that Arnulf de Metz was the son of Arnoald de Metz. He also drew on various saints' lives. Kelley now concurs with Settipani's revised version of that pedigree. Jarnut has also explored this connection (1986, pp. 14-22). Arnulf of Metz;From Wikipedia, the free encyclopedia (For other uses, see St Arnulf disambiguation). Saint Arnulf of Metz (c. 582, Lay-Saint-Christophe, Meurthe-et-Moselle — 640) was a Frankish bishop of Metz and advisor to the Merovingian court of Austrasia, who retired to the Abbey of Remiremont. Arnulf was born to an important Frankish family at an uncertain date around 582. His father was Baudgise or Baudegisel II of Aquitaine or Carthage (d. 588), Palace Mayor and Duke of Sueve. His mother was Oda.. In his younger years he was called to the Merovingian court of king Theudebert II (595-612) of Austrasia and sent to serve as dux at the Schelde. Later he became bishop of Metz. During his career he was attracted to religious life, and he retired to become a monk. After his death he was canonized as a saint. In French he is also known as Arnoul or Arnoulf. Arnulf gave distinguished service at the Austrasian court under Theudebert II After the death of Theudebert in 612 he was made bishop of Metz. The rule of Austrasia came into the hands of Brunhilda, the grandmother of Theudebert, who ruled also in Burgundy in the name of her great-grandchildren. In 613 Arnulf joined his politics with Pippin of Landen and led the opposition of Frankish nobles against Queen Brunhilda. The revolt led to her overthrow, torture, and eventual execution, and the subsequent reunification of Frankish lands under Chlothachar II. Chlothachar later made his son Dagobert I king of Austrasia and he ruled with the help of his advisor Arnulf. Not satisfied with his position, as a bishop he was involved in the murder of Chrodoald in 624, an important leader of the Frankish Agilolfings family and a protégé of Dagobert. From 623 (with Pippin of Landen, then the Mayor of the Palace), Arnulf was an adviser to Dagobert I. He retired around 628 to a hermitage at a mountain site in the Vosges, to realize his lifelong resolution to become a monk and a hermit. His friend Romaric, whose parents were killed by Brunhilda, had preceded him to the mountains and together with Amatus had already established Remiremont Abbey there. Arnulf settled there, and remained there until his death twelve years later. Arnulf was canonized as a saint by the Roman Catholic Church. In iconography he is portrayed with a rake in his hand and is often confused in legend with Arnold of Soissons, who is a patron saint of brewing. Shortly after 800, most likely in Metz, a brief genealogy of the Carolingians was compiled, modelled in style after the genealogy of Jesus in the New Testament. According to this source, Arnulf's father was a certain Arnoald, who in turn was the son of a nobilissimus Ansbertus and Blithilt (or Blithilde), an alleged and otherwise unattested daughter of Chlothar I. This late attribution of royal Merovingian descent at a time when the Carolingian dynasty was at the peak of its power contrasts clearly with the contemporary Vita Sancti Arnulfi's failure to mention any such a connection: The Vita, written shortly after the saint's death, merely states that he was of Frankish ancestry, from "sufficiently elevated and noble parentage, and very rich in worldly goods", without making any claims to royal blood. While modern historians generally dismiss the later Carolingian genealogy as spurious, it constitutes an important link in Christian Settipani's suggested line of unbroken descent from antiquity via Flavius Afranius Syagrius. Arnulf was married ca 596 to a woman whom later sources give the name of Dode or Doda, (born ca 584), and had children. Chlodulf of Metz was his oldest son, but more important is his second son Ansegisel, who married Begga daughter of Pepin I, Pippin of Landen. Arnulf is thus the male-line grandfather of Charles Martel and great-great grandfather of Charlemagne. ARNOUL [Arnulf], son of [ARNOLD & his wife ---] ([580/85]-Remiremont 18 Jul , bur Remiremont, later transferred to Metz, basilique de Saint-Arnoul). The origins of Arnulf are unknown. The Vita Sancti Arnulfi names "Arnulfus episcopus prosapia genitus Francorum" but gives no further details of his ancestry. The Gesta Episcoporum Mettensis names "Arnulfus…ex nobilissimo fortissimoque Francorum stemmate ortus", with no further information on his parentage, as ninth bishop of Metz and "palatii moderator". A 9th century genealogy names "beatum Arnulfum episcopum" as the son of Arnold. Settipani points out that this genealogy forms part of a series compiled at Metz, from the late 8th century onwards, which glorify the ancestry of the Carolingian dynasty by establishing descent from the early Merovingians as well as from a family of Roman senatorial origin. Further confusion is added by the Gesta Episcoporum Mettensis which names "Agiulfus" as sixth bishop of Metz, stating that "patre ex nobili senatorum familia orto, ex Chlodovei regis Francorum filia procreatus", and that "nepos ipsius…Arnoaldus" succeeded him as bishop, the alleged senatorial and Merovingian ancestry appearing to provide the basis for the 9th century genealogy although the latter assigns the descent to what appears to be a different Arnold. The Gesta Episcoporum Mettensis makes no family connection between Arnulf and his predecessor bishops. Another genealogy from the 8th/9th century names "Buotgisus" as father of "Arnulfum…episcopum urbis Metensium", although the editor of the Monumenta Germaniæ in which this is published cites another source which names "Burtgisus, qui a multis cognominatur Arnoaldus" although the dating of the latter is unclear. Arnulf entered the service of Theodebert King of Austrasia, becoming intendant of the royal domains. Together with Warnachar, maior domus of the palace of Burgundy, he helped King Clotaire II defeat King Sigebert II and the latter's great-grandmother Queen Brunechildis in 613. Sigeberto's Vita Landiberto episcopi Traiectensis names "Pippinus…principes Francorum…paterni avi eius Arnulfi", specifying that he was "primo maior domus regis post Mettensis episcopus", although no other document has been found which indicates that Arnulf held the position of maior domus in Austrasia. Elected Bishop of Metz in , Arnulf retired to the monastery of Remiremont, Vosges in 629. A charter dated 20 Feb 691 of "Pippinus filius Ansegisili quondam necnon…matrone mea Plectrudis" donating property to the church of St Arnulf at Metz specifies that "domnus et avus noster Arnulphus" was buried in the church. A list of bishops of Metz records "Arnulfus" as 29th bishop, that he held the position for 10 years, and died "XVII Kal Sep". m [DODA], daughter of ---. The 11th century life of her son Chlodulf names “mater…Chlodulfi Doda”. Settipani states that this is the only source which names Arnulf´s wife, and inevitably casts doubt on the accuracy of the source written several centuries after she lived. Arnulf was married ca 596 to a woman who later sources give the name of Dode or Doda, (born ca 584), and had children. Chlodulf of Metz was his oldest son, but more important is his second son Ansegisel, who married Begga daughter of Pepin I, Pippin of Landen. 1. ^ Vita Arnulfi c. 1, MG. SS. rer. Merov. 2, p. 432. 2. ^ Cf. R. Schieffer, Die Karolinger, Verlag W. Kohlhammer, Stuttgart / Berlin / Köln, 2nd ed., 1997. * Alban Butler's Lives of the Saints, edited, revised and supplemented by Thurston and Attwater. Christian Classics, Westminster, Maryland. * Christian Settipani - La Préhistoire des Capétiens, Première Partie. St Arnulf (Arnoul), 'de Heristal' Bishop Of Metz, Mayor of the Palace of Austrasia and tutor of Dagobert. Source: 'Royalty for Commoners', Roderick W. Stuart, 1993, p 129. 'Pedigrees of Some of the Emperor Charlemagne's Descendants', Langston & Buck, 1986, p cv. Saint Arnulf of Metz was born of an important Frankish family at an uncertain date around 582. In his younger years he was called to the Merovingian court to serve king Theudebert II (595-612) of Austrasia and as dux at the Schelde. Later he became bishop of Metz. During his life he was attracted to religious life and he retired as a monk. After his death he was canonized as a saint. In the French language he is also known as Arnoul or Arnoulf. Arnulf was canonized as a saint by the Roman Catholic Church. In iconography, he is portrayed with a rake in his hand and is often confused in legend with Arnold of Soissons, who is a patron saint of brewing. Shortly after 800, most likely in Metz, a brief genealogy of the Carolingians was compiled, modelled in style after the genealogy of Jesus in the New Testament. According to this source, Arnulf's father was a certain Arnoald, who in turn was the son of a nobilissimus Ansbertus and Blithilt (or Blithilde), an alleged and otherwise unattested daughter of Chlothar I. This late attribution of royal Merovingian descent at a time when the Carolingian dynasty was at the peak of its power contrasts clearly with the contemporary Vita Sancti Arnulfi's failure to mention any such a connection: The Vita, written shortly after the saint's death, merely states that he was of Frankish ancestry, from "sufficiently elevated and noble parentage, and very rich in worldly goods", without making any claims to royal blood. While modern historians generally dismiss the later Carolingian genealogy as spurious, it constitutes an important link in Christian Settipani's suggested line of descent from antiquity via Flavius Afranius Syagrius. Statesman, bishop under the Merovingians, born c. 580; died c. 640. His parents belonged to a distinguished Frankish family, and lived in Austrasia, the eastern section of the kingdom founded by Clovis. In the school in which he was placed during his boyhood he excelled through his talent and his good behaviour. According to the custom of the age, he was sent in due time to the court of Theodebert II, King of Austrasia (595-612), to be initiated in the various branches of the government. Under the guidance of Gundulf , the Mayor of the Palace, he soon became so proficient that he was placed on the regular list of royal officers, and among the first of the kings ministers. He distinguished himself both as a military commander and in the civil administration; at one time he had under his care six distinct provinces. In due course Arnulf was married to a Frankish woman of noble lineage, by whom he had two sons, Anseghisel and Clodulf. While Arnulf was enjoying worldly emoluments and honours he did not forget higher and spiritual things. His thoughts dwelled often on monasteries, and with his friend Romaricus, likewise an officer of the court, he planned to make a pilgrimage to the Abbey of Lérins, evidently for the purpose of devoting his life to God. But in the meantime the Episcopal See of Metz became vacant. Arnulf was universally designated as a worthy candidate for the office, and he was consecrated bishop of that see about 611. In his new position he set the example of a virtuous life to his subjects, and attended to matters of ecclesiastical government. In 625 he took part in a council held by the Frankish bishops at Reims. With all this Arnulf retained his station at the court of the king, and took a prominent part in the national life of his people. In 613, after the death of Theodebert, he, with Pepin of Landen and other nobles, called to Austrasia Clothaire II, King of Neustria. When, in 625, the realm of Austrasia was entrusted to the kings son Dagobert, Arnulf became not only the tutor, but also the chief minister, of the young king. At the time of the estrangement between the two kings, and 625, Arnulf with other bishops and nobles tried to effect a reconciliation. But Arnulf dreaded the responsibilities of the episcopal office and grew weary of court life. About the year 626 he obtained the appointment of a successor to the Episcopal See of Metz; he himself and his friend Romaricus withdrew to a solitary place in the mountains of the Vosges. There he lived in communion with God until his death. His remains, interred by Romaricus, were transferred about a year afterwards, by Bishop Goeric, to the basilica of the Holy Apostles in Metz. Of the two sons of Arnulf, Clodulf became his third successor in the See of Metz. Anseghisel remained in the service of the State; from his union with Begga, a daughter of Pepin of Landen, was born Pepin of Heristal, the founder of the Carlovingian dynasty. In this manner Arnulf was the ancestor of the mighty rulers of that house. The life or Arnulf exhibits to a certain extent the episcopal office and career in the Merovingian State. The bishops were much considered at court; their advice was listened to; they took part in the dispensation of justice by the courts; they had a voice in the appointment of royal officers; they were often used as the king's ambassadors, and held high administrative positions. For the people under their care, they were theprotectors of their rights, their spokesmen before the king and the link uniting royalty with its subjects. The opportunities for good were thus unlimited; and Arnulf used them to good advantage. Arnulf van Metz (Lay-Saint-Christophe (bij Nancy), 13 augustus 582 - bij Remiremont, 16 augustus 640) was een Frankische edelman, die een grote invloed had in de Merovingische koninkrijken als bisschop. Hij werd later heilig verklaard. Arnulf diende het Austrasische hof onder Theudebert II (595-612). In 613 echter leidde hij met Pepijn van Landen de aristocratische opstand tegen koningin Brunhilde van Austrasië, wat leidde tot haar onttroning en de hereniging van het Frankische Rijk onder Chlotharius II. In hetzelfde jaar werd hij bisschop van Metz. Van 623 was hij samen met Pepijn, die toen hofmeier was van het Austrasische hof, adviseur van koning Dagobert I. Hij trad uit het openbare leven in 623 toen hij zich terugtrok in de Vogezen. Ansegisel trouwde met Pepijns dochter, Begga, en de zoon van de twee, Pepijn van Herstal, was de overgrootvader van Karel de Grote. Arnulf wordt dan ook gezien als de stamvader van de Karolingen. Arnulf is de beschermheilige van het brouwen. Zijn naamdagen vallen op 18 juli en 16 augustus. Saint Arnulf of Metz was born of an important Frankish family at an uncertain date around 582. In his younger years he was called to the Merovingian court to serve king Theudebert II (595-612) of Austrasia and as dux at the Scheldt. Later he became bishop of Metz. During his life he was attracted to religious life and he retired as a monk. After his death he was canonized as a saint. In the French language he is also known as Arnoul or Arnoulf. Arnulf gave distinguished service at the Austrasian court under Theudebert II After the death of Theudebert in 612 he was made bishop of Metz. The rule of Austrasia came in hands of Brunhilda, the grandmother of Theudebert, who ruled also in Burgundy in name of her great-grandchildren. In 613 Arnulf joined his politics with Pippin of Landen and led the opposition of Frankish nobles against Queen Brunhilda. The revolt led to her overthrow, torture, and eventual execution, and the subsequent reunification of Frankish lands under Chlothachar II. Chlothachar later made his son Dagobert I king of Austrasia and he ruled with the help of his advisor Arnulf. Not satisfied with his position, as a bishop he was involved in the murder of Chrodoald in 624, an impportant leader of the Frankish Agilolfings-family and a protégé of Dagobert. From 623 (with Pippin of Landen, then the Mayor of the Palace), Arnulf was an adviser to Dagobert I. He retired around 628 to a hermitage at a mountain site in the Vosges, to implement his lifelong resolution to become a monk and a hermit. His friend Romaric, whose parents were killed by Brunhilda, had preceded him to the mountains and together with Amatus had already established Remiremont Abbey there. Arnulf settled there, and remained there until his death twelve years later. Arnulf was married to a woman who may have been called Doda and had children. Chlodulf of Metz was his oldest son, but more important is his second son Ansegisel, who married Begga daughter of Pippin of Landen. His father may have been Arnoald, who also was dux of the Scheldt before becoming bishop of Metz. Christian Settipani - La Préhistoire des Capétiens, Première Partie. Arnoul est né vers 582, au château de Layum aujourd’hui Lay-Saint-Christophe près de Nancy. Héritier des Mérovingiens[réf. nécessaire], il appartient à une grande famille de la noblesse franque située dans la Woëvre et dont les biens s'étendaient entre Metz et Verdun. Il fut éduqué au palais d'Austrasie. Devenu adulte, il entre au service de Théodebert II dont il est un temps intendant des domaines royaux. Il songe à se retirer pour mener une vie ascétique mais sa famille parvient à le marier en 611 à Dode d'Héristal avec qui il aura deux fils Chlodulf (? - † 697) et Ansegisèle (? - † av.679). Par sa position de leude à la cour, il entre dans l'opposition contre Brunehilde et s'allie avec Clotaire II. Suite à cela il se retrouve associé à Pépin de Landen ; ils partageront le pouvoir et leurs enfants se marieront. En 613, Clotaire II devient maître de tout le royaume et récompense ses fidèles. Alors qu'Arnoul envisage de se retirer dans un monastère avec son ami Romaric, le roi Clothaire II l'invite expressément à accepter le siège épiscopal de l'évêché de Metz qui est la capitale du royaume d'Austrasie. Porté malgré lui sur le siège de Saint Clément, il sera de 614 à 627, 29e évêque de Metz et fera preuve d'un dévouement dans l'accomplissement de ses attributs. Il sera pour cela très apprécié et Clothaire II continuera à l'associer au gouvernement de l'Austrasie. Il aura donc tenu un rôle très important tant dans la vie de l'église que dans la gestion du royaume d'Austrasie. Clotaire II le nomme précepteur de son fils Dagobert Ier, dernier grand roi mérovingien. Il fut maire du Palais (palatinus) et domesticus, c'est à dire conseiller de celui-ci. Lorsque Clotaire II nomma Arnoul évêque de Metz, son épouse Dode d'Héristal entra au couvent puisqu'un évêque ne peut être marié. Associé à Pépin l'ancien, il participa à la chute de Brunehaut. Son fils Ansegise, épousa Begga, fille de Pépin. Ainsi naquit la dynastie carolingienne. En 629, lorsque meurt Clotaire II, il peut enfin se retirer et entrer dans les ordres. Il rejoint son ami saint Romaric, fondateur du monastère de Remiremont (Romarici Mons) selon la règle de saint Colomban. Il finira ses jours en ermite, non loin du monastère, priant et servant les lépreux qu'il accueille dans son ermitage. Arnoul mourut le 16 août 641 au Saint-Mont. Ses restes furent transférés à Metz dans l'église des Saints-Apôtres, qui prit le nom de Saint Arnoul en 717. Son nom reste associé à un trésor de la cathédrale de Metz qui a miraculeusement échappé à la rapacité révolutionnaire ; un anneau, en or fin massif, d'un travail assez grossier, comportant une agathe onyx sur laquelle est gravée un poisson engagé dans une nasse autour de laquelle se noient deux autres poissons. Cette scène n'est pas sans rappeler le fait historique ou anecdotique lié à cet anneau et rapporté par l'écrivain Paul Diacre lui même le tenant de la bouche même de Charlemagne. Selon cet auteur, Saint Arnoul passant sur un pont de la Moselle jeta dans le fleuve le dit anneau en priant Dieu de le lui rendre en témoignage du pardon de ses fautes. Quelques temps après, on retrouva dans les entrailles d'un poisson l'anneau épiscopal. C'est en souvenir de ce fait que depuis on le portait en procession à l'église de Saint Arnoul le jour de la fête du saint évêque. Enlevé en 1793 avec les vases sacrés de la cathédrale, il fut racheté par un des officiers de la monnaie. ll fut rendu au trésor en 1846. Sa vie, où il a laissé le souvenir d'un grand d'Austrasie, malgré son opposition à Brunehilde, mais aussi surtout sa légende, dite Légende de Saint Arnoul a marqué profondément la mémoire des régions de l'Est de la France. This research published in 1963. shows the pedigree from Arnulf of Metz over Charlemagne to the Dukes of Braunschweig-Lüneburg and then via marriage to the Brahe family on to Denmark, Sweden and Finland. ^ Vita Arnulfi c. 1, MG. SS. rer. Merov. 2, p. 432. ^ Cf. R. Schieffer, Die Karolinger, Verlag W. Kohlhammer, Stuttgart / Berlin / Köln, 2nd ed., 1997. Saint Arnulf of Metz (c 582, Lay-Saint-Christophe, Meurthe-et-Moselle — 640) was a Frankish bishop of Metz and advisor to the Merovingian court of Austrasia, who retired to the Abbey of Remiremont. Arnulf was born of an important Frankish family at an uncertain date around 582. In his younger years he was called to the Merovingian court of king Theudebert II (595-612) of Austrasia and sent to serve as dux at the Schelde. Later he became bishop of Metz. During his career he was attracted to religious life, and he retired to become a monk. After his death he was canonized as a saint. In French he is also known as Arnoul or Arnoulf. Shortly after 800, most likely in Metz, a brief genealogy of the Carolingians was compiled, modelled in style after the genealogy of Jesus in the New Testament. According to this source, Arnulf's father was a certain Arnoald, who in turn was the son of a nobilissimus Ansbertus and Blithilt (or Blithilde), an alleged and otherwise unattested daughter of Chlothar I. This late attribution of royal Merovingian descent at a time when the Carolingian dynasty was at the peak of its power contrasts clearly with the contemporary Vita Sancti Arnulfi's failure to mention any such a connection: The Vita, written shortly after the saint's death, merely states that he was of Frankish ancestry, from "sufficiently elevated and noble parentage, and very rich in worldly goods", without making any claims to royal blood. While modern historians generally dismiss the later Carolingian genealogy as spurious, it constitutes an important link in Christian Settipani's suggested line of unbroken descent from antiquity via Flavius Afranius Syagrius. Arnulf was married ca 596 to a woman whom later sources give the name of Dode or Doda, (born ca 584), and had children. Chlodulf of Metz was his oldest son, but more important is his second son Ansegisel, who married Begga daughter of Pepin I, Pippin of Landen. Born c. 580/82 in Austrasia. Arnulf was Descended from a noble Frankish family. 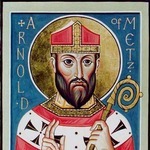 St. Arnulf of Metz was also the great-great grandfather of Charlemagne. Arnulf was a courtier in the service of Theodebert II of Austrasia (595-612). Considered to have been a good warrior and diplomat, Arnulf wished to become a monk at Lérins; his wife, Doda, had become a nun at Treves. Starting off as a wealthy noble, Arnulf was known to indulge himself in luxuries of the time, including all manor of drink, women, and other decadent pastimes of the day. When he determined to shed his venial shortcomings and dedicate himself to the church as a monk, a man who doubted his veracity publically denounced his reformation as mere show. Later that evening while he slept, his pants spontaneously caught fire, which was later attributed to his having 'lied' about Arnulf's alleged behavior. Today, the childhood taunt of, "liar, liar, pants on fire," echoes back to this incident and seeks to remind us not to bear false witness against our neighbors. When he first resigned his see as Bishop of Metz, he threw his Episcopal ring into the sea. The next day he was brought a fish to eat and, inside the fish, he found his ring. He took it as an indication that God meant him to be Bishop of Metz. He believed that the polluted water caused illness, while the boiled and processed water used for beer was a safer alternative. According to legend he ended a plague when he submerged his crucifix into a brew kettle and persuaded people to drink only beer from that "blessed" kettle. He is reported to have said, "From man's sweat and God's love, beer came into the world." St. Arnulf's main claim to beer fame is that he successfully appealed to God for cold beer for the soldiers to drink during a battle in Flanders in the 11th century. Certainly a person we would want on our side. He also is said to have been able to multiply beer into vast quantities through blessing and prayer. Following the collapse of the roof of an abbey brewery in Flanders, the good Saint Arnold of Soissons asked God to multiply the stores of beer which were left for the monk's consumption. When Arnold's prayer was answered in abundance, the monks and townspeople were prepared to canonize him on the spot. In 641, after his death, the citizens of Metz requested that Saint Arnulf's body be exhumed and carried from the monastery to the town of Metz for reburial in their local church-the church where Arnulf had so frequently preached the virtues of beer. Their request was granted. It was a long and thirsty journey, especially since they were carrying a dead bishop. Statesman, bishop under the Merovingians. His parents belonged to a distinguished Frankish family, and lived in Austrasia, the eastern section of the kingdom founded by Clovis. In the school in which he was placed during his boyhood he excelled through his talent and his good behaviour. According to the custom of the age, he was sent in due time to the court of Theodebert II, King of Austrasia (595-612), to be initiated in the various branches of the government. Under the guidance of Gundulf, the Mayor of the Palace, he soon became so proficient that he was placed on the regular list of royal officers, and among the first of the kings ministers. He distinguished himself both as a military commander and in the civil administration; at one time he had under his care six distinct provinces. In due course Arnulf was married to a Frankish woman of noble lineage, by whom he had two sons, Anseghisel and Clodulf. While Arnulf was enjoying worldly emoluments and honours he did not forget higher and spiritual things. His thoughts dwelled often on monasteries, and with his friend Romaricus, likewise an officer of the court, he planned to make a pilgrimage to the Abbey of Lérins, evidently for the purpose of devoting his life to God. But in the meantime the Episcopal See of Metz became vacant. Arnulf was universally designated as a worthy candidate for the office, and he was consecrated bishop of that see about 611. In his new position he set the example of a virtuous life to his subjects, and attended to matters of ecclesiastical government. In 625 he took part in a council held by the Frankish bishops at Reims. With all this Arnulf retained his station at the court of the king, and took a prominent part in the national life of his people. In 613, after the death of Theodebert, he, with Pepin of Landen and other nobles, called to Austrasia Clothaire II, King of Neustria. When, in 625, the realm of Austrasia was entrusted to the kings son Dagobert, Arnulf became not only the tutor, but also the chief minister, of the young king. At the time of the estrangement between the two kings, and 625, Arnulf with other bishops and nobles tried to effect a reconciliation. But Arnulf dreaded the responsibilities of the episcopal office and grew weary of court life. About the year 626 he obtained the appointment of a successor to the Episcopal See of Metz; he himself and his friend Romaricus withdrew to a solitary place in the mountains of the Vosges. There he lived in communion with God until his death. His remains, interred by Romaricus, were transferred about a year afterwards, by Bishop Goeric, to the basilica of the Holy Apostles in Metz. Of the two sons of Arnulf, Clodulf became his third successor in the See of Metz. Anseghisel remained in the service of the State; from his union with Begga, a daughter of Pepin of Landen, was born Pepin of Heristal, the founder of the Carlovingian dynasty. In this manner Arnulf was the ancestor of the mighty rulers of that house. The life or Arnulf exhibits to a certain extent the episcopal office and career in the Merovingian State. The bishops were much considered at court; their advice was listened to; they took part in the dispensation of justice by the courts; they had a voice in the appointment of royal officers; they were often used as the king's ambassadors, and held high administrative positions. For the people under their care, they were the protectors of their rights, their spokesmen before the king and the link uniting royalty with its subjects. The opportunities for good were thus unlimited; and Arnulf used them to good advantage. Arnulf was a powerful Austrasian noble during the time of Mayor Pepin I, and their two children Ansegisel and Begga were married. According to Frankish myth, Arnulf was the son of Bodigisel, a supposed son of Saint Gendolphus, Bishop of Tongress, and Oda de Savoy. This bishop was an actual historical figure, the son of Arthemia and Munderic of Vitry. According again to the myths, Munderic was the son of Cloderic the Paricide, son of the historic Sigisbert the Lame. This Sigisbert was the son of King Childebert of Cologne, another historical figure that died sometime shortly after 450. He was the supposed son of one Clovis the Riparian who died after 420. Arnulf (c.580-640), Biskop AV Metz. Han var en Frankiska adelsman SOM tjänstgjorde VID domstolen i Theodebert II, Kung av Austrasien. Han gifte SIG MED en dotter till Greven av Boulogne, Som Kallas Doda, by sv AV SINA Söner Ansegisel de blev förfäder Karolingiska kejsare. Theodebert II hund ÅR 612 OCH Arnulf ihop en betydande Andel AV en efterträdare Har utsetts, Clothar II. Arnulf vigdes till Biskop AV Metz i 614, da förmodligen Hans hustru var dödsdatum. Fran 624 Han hjälpte Clothar son Dagobert Styra Ardennerna. Under manga ÅR hade dock Han velat avgå se OCH bli en eremit: Att Han uppnås efter Att delta i Raden i Clichy (626) OCH i Reims (627). Med synd Vän Romaricus ledde Han en ensam Liv i Vosges berg, Som utvecklades senare till klostret Remiremont. Högtid: 18 Juli. Arnulfo prestou serviço diferenciado na corte austrasiana sob Teodeberto II (595-612). Por volta de 611 ele foi ordenado bispo de Metz. Em 613, ele e Pepino de Landen, cuja filha, Begga, havia casado com seu filho Ansegisel, lideraram a oposição dos nobres francos à rainha Brunilda da Austrásia. Brunilda foi derrubada do poder, torturada e finalmente executada, sendo subseqüentemente os reinos francos reunificados sob Clotário I, sobrinho da poderosa rainha. Apesar de Arnulfo querer se retirar para os montes Vosges como um eremita, ele foi persuadido a permanecer e se tornar bispo de Metz. A partir de 623 (com Pepino de Landen, então o prefeito do palácio), Arnulfo foi conselheiro de Dagoberto I. Junto com seu amigo Romarico, ele se retirou para os Vosges em 627, para implementar sua decisão para toda a vida de se tornar um eremita. Antes de ser consagrado, ele teve dois filhos com sua esposa Doda: Ansegisel e Clodulfo. Ansegisel casou-se com Begga, filha de Pepino de Landen, tendo com ela um filho, Pepino de Herstal, um dos bisavôs de Carlos Magno. Clodulfo, como seu pai, tornou-se bispo de Metz. A existência de um terceiro filho chamado Martinho é considerada duvidosa. Arnulfo foi canonizado santo pela Igreja Católica Romana e é conhecido como o santo patrono dos cervejeiros. Comemora-se seu dia em uma dessa datas: 18 de Julho ou 16 de Agosto. Na iconografia, ele é retratado com um ancinho em sua mão. Ele é freqüentemente confundido nas lendas com Arnoldo de Soissons, que é outro santo patrono dos cervejeiros. Saint Arnulf of Metz (c 582 — 640) was a Frankish bishop of Metz and advisor to the Merovingian court of Austrasia, who retired to the Abbey of Remiremont. Chlothachar later made his son Dagobert I king of Austrasia and he ruled with the help of his advisor Arnulf. Not satisfied with his position, as a bishop he was involved in the murder of Chrodoald in 624, an important leader of the Frankish Agilolfings-family and a protégé of Dagobert. Shortly after 800, most likely in Metz, a brief genealogy of the Carolingians was compiled, modelled in style after the genealogy of Jesus in the New Testament. According to this source, Arnulf's father was a certain Arnoald, who in turn was the son of a nobilissimus Ansbert and Blithilt (or Blithilde), an alleged and otherwise unattested daughter of Chlothar I. This late attribution of royal Merovingian descent at a time when the Carolingian dynasty was at the peak of its power contrasts clearly with the contemporary Vita Sancti Arnulfi's failure to mention any such a connection: The Vita, written shortly after the saint's death, merely states that he was of Francish ancestry, from "sufficiently elevated and noble parentage, and very rich in worldly goods", without making any claims to royal blood. While modern historians generally dismiss the later Carolingian genealogy as spurious, it constitutes an important link in Christian Settipani's suggested line of descent from antiquity via Flavius Afranius Syagrius. Arnulf was married ca 596 to a woman who later sources give the name of Dode or Doda, born ca 584 and daughter of Arnoald and wife Oda (? ), and had children. Chlodulf of Metz was his oldest son, but more important is his second son Ansegisel, who married Begga daughter of Pepin I, Pippin of Landen. Weis, Frederick Lewis. Ancestral Roots of Sixty Colonists Who Came to New England Between 1623 and 1650. Fifth Edition. Baltimore, Maryland: Genealogical Publishing Co., 1982. Stuart, Roderick W. Royalty for Commoners, The Complete Known Lineage of John of Gaunt, Son of Edward III, King of England, and Queen Philippa. Fourth Edition. Baltimore: Genealogical Publishing Company, 2002. Moriarty, G. Andrews. "The Origin of the Carolingians", The New England Historical and Genealogical Register volume XCVIII (October 1944). Kelley, David H.. "Genealogical Research in England: A New Consideration of the Carolingians", The New England Historical and Genealogical Register volume CI (April 1947). Moriarty, G. Andrews. "The Origin of Capet and Plantagenet", The New England Historical and Genealogical Register volume CVII (October 1953). Palace] gains progressively greater importance. On 18 October 614, Clotaire II signed the Edict of Paris which in 27 articles, essentially formed the basic power structure for the Council of Bishops and the Assembly of the Greats [nobles]. Note: In 623, Clotaire II was pushed by the Bishop of Metz and also Pepin [Le Vieux de Landen] , the Mayor of the Palace to give Austrasia its own King. Thus, Clotaire II's son Dagobert became King of Austrasia and under the tutelage of Arnoul. was born of an important Frankish family at an uncertain date around 582. In his younger years he was called to the Merovingian court to serve king Theudebert II (595-612) of Austrasia and as dux at the Scheldt. Later he became bishop of Metz. During his life he was attracted to religious life and he retired as a monk. After his death he was canonized as a saint. In the French language he is also known as Arnoul or Arnoulf. Saint Arnulf (or Arnoul), Bishop of Metz, son of Arnoldus and Dode of Heristal, was born August 13, 582. He was a courtier in the service of Theodebert II of Austrasia. He married Oda (or Dode) de Savoy , daughter of Arnoald, and they had two sons, Clodulf and Ansegisel. Oda became a nun at Treves in 610, and Arnulf dreamed of becoming a monk at Lerins. However, about 611, Arnulf was consecrated Bishop of Metz. About 626 Arnulf became weary of his duties, resigned his position, and became a hermit in a solitary place in the mountains with his friend Romaricus. Arnulf died August 16, 640 or 641, and was buried by Romaricus. About a year later, Bishop Goeric transferred his remains to the Basilica of the Holy Apostles in Metz, Germany. July 18 is the Feast Day of St. Arnulf. Shortly after 800, most likely in Metz, a brief genealogy of the Carolingians was compiled, modelled in style after the genealogy of Jesus in the New Testament. According to this source, Arnulf's father was a certain Arnoald, who in turn was the son of a nobilissimus Ansbert and Blithilt (or Blithilde), an alleged and otherwise unattested daughter of Chlothar I. This late attribution of royal Merovingian descent at a time when the Carolingian dynasty was at the peak of its power contrasts clearly with the contemporary Vita Sancti Arnulfi's failure to mention any such a connection: The Vita, written shortly after the saint's death, merely states that he was of Frankish ancestry, from "sufficiently elevated and noble parentage, and very rich in worldly goods", without making any claims to royal blood. While modern historians generally dismiss the later Carolingian genealogy as spurious, it constitutes an important link in Christian Settipani's suggested line of descent from antiquity via Flavius Afranius Syagrius. A Frankish noble, Arnulf gave distinguished service at the Austrasian court under Theudebert II (595-612). In 613, however, with Pepin he led the aristocratic opposition to Brunhild that led to her downfall and the reunification of Frankish lands under Choltar II. About the same year, he became bishop. From 623, again with Pepin, now mayor of the Austrasian palace, Arnulf was adviser to Dagobert I, before retiring (629?) to become a hermit. Arnulf's son Ansegisel married Pepin's daughter Begga; the son of this marriage, Pepin II, was Charlemagne's great-grandfather. In his younger years he was called to the Merovingian court of king Theudebert II (595-612) of Austrasia and sent to serve as dux at the Schelde (his great uncle held the post of Chief Advisor of the palace and the king). Later he became (the 29th) Bishop of Metz (613-628). During his career he was attracted to religious life, and he retired to become a monk. After his death he was canonized as a saint. In French he is also known as Arnoul or Arnoulf. Arnulf gave distinguished service at the Austrasian court under Theudebert II After the death of Theudebert in 612 he was made bishop of Metz. The rule of Austrasia came into the hands of Brunhilda, the grandmother of Theudebert, who ruled also in Burgundy in the name of her great-grandchildren. In 613 Arnulf joined his politics with Pippin of Landen and led the opposition of Frankish nobles against Queen Brunhilda. The revolt led to her overthrow, torture, and eventual execution, and the subsequent reunification of Frankish lands under Chlothachar II. His friend Romaric, whose parents were killed by Brunhilda, had preceded him to the mountains and together with Amatus had already established Remiremont Abbey there. Arnulf settled there, and remained there until his death 12 years later. Shortly after 800, most likely in Metz, a brief genealogy of the Carolingians was compiled, modelled in style after the genealogy of Jesus in the New Testament. According to this source, Arnulf's father was a certain Arnoald, who in turn was the son of a nobilissimus Ansbertus and Blithilt (or Blithilde), an alleged and otherwise unattested daughter of Chlothar I. This late attribution of royal Merovingian descent at a time when the Carolingian dynasty was at the peak of its power contrasts clearly with the contemporary Vita Sancti Arnulfi's failure to mention any such a connection: The Vita, written shortly after the saint's death, merely states that he was of Frankish ancestry, from "sufficiently elevated and noble parentage, and very rich in worldly goods", without making any claims to royal blood. While modern historians generally dismiss the later Carolingian genealogy as spurious, it constitutes an important link in Christian Settipani's suggested line of unbroken descent from antiquity via Flavius Afranius Syagrius. Arnulf was married ca 596 to a woman whom later sources give the name of Dode or Doda, (born ca 584), and had children. Chlodulf of Metz was his oldest son, but more important is his second son Ansegisel, who married Begga daughter of Pepin I, Pippin of Landen. Arnulf is thus the male-line grandfather of Charles Martel and great-great grandfather of Charlemagne. "St Arnold decided one day to throw his ring into the Moselle. His gesture was an act of humility. In throwing, he said: 'I will believe that God has forgiven my sins when I will again find this ring.' Thus was born a famous legend in which a fish swallowed the ring, was caught, and served shortly after to the episcopal table. If the legend is to be believed, God indirectly contacted Arnold, telling him that he was absolved of his sins and made a legitimate representative of God on earth." 1.^ Vita Arnulfi c. 1, MG. SS. rer. Merov. 2, p. 432. 2.^ Cf. R. Schieffer, Die Karolinger, Verlag W. Kohlhammer, Stuttgart / Berlin / Köln, 2nd ed., 1997. AMONG the illustrious saints who adorned the court of King Clotaire the Great, none is more famous than St. Arnoul. He was a Frenchman, born of rich and noble parents; and, having been educated in learning and piety, was called to the court of King Theodebert, in which he held the second place among the great officers of state, being next to Gondulph, mayor of the palace. Though young, he was equally admired for prudence in the council and for valour in the field. By assiduous prayer, fasting, and excessive almsdeeds, he joined the virtues of a perfect Christian with the duties of a courtier. Having married a noble lady called Doda, he had by her two sons, Clodulf and Ansegisus; by the latter the Carlovingian race of kings of France descended from St. Arnoul. Fearing the danger of entangling his soul in many affairs which passed through his hands, he desired to retire to the monastery of Lerins; but being crossed in the execution of his project, passed to the court of King Clotaire. That great monarch, the first year in which he reigned over all France, assented to the earnest unanimous request of the clergy and people of Metz, demanding Arnoul for their bishop. Our saint did all that could be done to change the measures taken, but in vain. He was consecrated bishop in 614, and his wife Doda took the religious veil at Triers. The king obliged Arnoul still to assist at his councils, and to fill the first place at his court. In 622 Clotaire II. divided his dominions, and making his son Dagobert king of Austrasia, appointed St. Arnoul duke of Austrasia and chief counsellor, and Pepin of Landen mayor of his palace. The reign of this prince was virtuous, prosperous, and glorious, so long as Arnoul remained at the helm; but the saint anxiously desiring to retire from all business, that he might more seriously study to secure his own salvation before he should be called hence, never ceased to solicit the king for leave to quit the court. Dagobert long refused his consent; but at length, out of a scruple lest he should oppose the call of heaven, granted it, though with the utmost reluctance. St. Arnoul resigned also his bishopric, and retired into the deserts of Vosge, near the monastery of Remiremont, on the top of a high mountain, where a hermitage is at this day standing. Here the saint laboured daily with fresh fervour to advance in the path of Christian perfection; for the greater progress a person has already made in virtue, the more does the prospect enlarge upon him, and the more perfectly does he see how much is yet wanting in him, and how great a scope is left for exerting his endeavours still more. Who will pretend to have made equal advances with St. Paul towards perfection? yet he was far from ever thinking that he had finished his work, or that he might remit anything in his endeavours. On the contrary, we find him imitating the alacrity of those who run in a race, who do not so much consider what ground they have already cleared, as how much still remains to call forth their utmost eagerness and strength. Nor can there be a more certain sign that a person has not yet arrived at the lowest and first degree of virtue, than that he should think he does not need to aim higher. In this vigorous pursuit St. Arnoul died on the 16th of August in 640. His remains were brought to Metz, and enrich the great abbey which bears his name. The Roman Martyrology mentions him on the 18th of July, on which day the translation of his relics was performed; the Gallican on the 16th of August. See his life, faithfully compiled by his successor, in Mabillon, Act. Bened. t. 2. p. 150. Also Calmet, Hist. de Lorraine, t. 1. l. 9. n. 10, &c., p. 378, 381, &c.; Bosch the Bollandist, t. 5. Jul. p. 423; and D. Cajot, Benedictin monk of St. Arnoul’s, Les Antiquités des Metz, an. 1761. ARNOUL [Arnulf], son of [ARNOLD & his wife ---] ([580/85]-Remiremont 18 Jul , bur Remiremont, later transferred to Metz, basilique de Saint-Arnoul). The origins of Arnulf are unknown. The Vita Sancti Arnulfi names "Arnulfus episcopus prosapia genitus Francorum" but gives no further details of his ancestry. The Gesta Episcoporum Mettensis names "Arnulfus…ex nobilissimo fortissimoque Francorum stemmate ortus", with no further information on his parentage, as ninth bishop of Metz and "palatii moderator". A 9th century genealogy names "beatum Arnulfum episcopum" as the son of Arnold. Settipani points out that this genealogy forms part of a series compiled at Metz, from the late 8th century onwards, which glorify the ancestry of the Carolingian dynasty by establishing descent from the early Merovingians as well as from a family of Roman senatorial origin. Further confusion is added by the Gesta Episcoporum Mettensis which names "Agiulfus" as sixth bishop of Metz, stating that "patre ex nobili senatorum familia orto, ex Chlodovei regis Francorum filia procreatus", and that "nepos ipsius…Arnoaldus" succeeded him as bishop, the alleged senatorial and Merovingian ancestry appearing to provide the basis for the 9th century genealogy although the latter assigns the descent to what appears to be a different Arnold. The Gesta Episcoporum Mettensis makes no family connection between Arnulf and his predecessor bishops. Another genealogy from the 8th/9th century names "Buotgisus" as father of "Arnulfum…episcopum urbis Metensium", although the editor of the Monumenta Germaniæ in which this is published cites another source which names "Burtgisus, qui a multis cognominatur Arnoaldus" although the dating of the latter is unclear. Arnulf entered the service of Theodebert King of Austrasia, becoming intendant of the royal domains. Together with Warnachar, maior domus of the palace of Burgundy, he helped King Clotaire II defeat King Sigebert II and the latter's great-grandmother Queen Brunechildis in 613. Sigeberto's Vita Landiberto episcopi Traiectensis names "Pippinus…principes Francorum…paterni avi eius Arnulfi", specifying that he was "primo maior domus regis post Mettensis episcopus", although no other document has been found which indicates that Arnulf held the position of maior domus in Austrasia. Elected Bishop of Metz in , Arnulf retired to the monastery of Remiremont, Vosges in 629. A charter dated 20 Feb 691 of "Pippinus filius Ansegisili quondam necnon…matrone mea Plectrudis" donating property to the church of St Arnulf at Metz specifies that "domnus et avus noster Arnulphus" was buried in the church. A list of bishops of Metz records "Arnulfus" as 29th bishop, that he held the position for 10 years, and died "XVII Kal Sep". married [DODA], daughter of ---. Spanish ;San Arnulfo de Metz (c. 582-640) fue un Franco Obispo de Metz y asesor de la merovingia corte de Austrasia, que se retiró a la abadia Remiremont . Arnulf nació de una importante familia de los francos en una fecha incierta en torno a 582. Su padre fue probablemente Bodegisel (m. 585/8), Palace Mayor y Duque de Sueve y su madre probablemente San Oda, abadesa de Amay. En sus años más jóvenes que él fue llamado a la merovingia corte del rey Teodeberto (595-612) de Austrasia y enviado a servir como dux en Escalda. Más tarde se convirtió en obispo de Metz . Durante su carrera se sintió atraído por la vida religiosa, y se retiró para convertirse en monje. Bishop and member of the court of the Frankish king Theodebert II of Austrasia, sometimes called Arnuiph or Arnulf of Metz. A noble, Arnulf married Doda, and their son was Ansegisel. Ansegisel married Beggia, the daughter of Pepin of Landen, starting the Carolingian dynasty of France. Doda became a nun, and Arnulf made plans to enter a monastery but was named the bishop of Nletz around 616. He continued his court services, making Clotaire of Neustria the king of Austrasia. He also served as counselor to Dagobert, King Clotaire's son. In 626, Arnulf retired to a hermitage at Remiremont, France. Arnulf was born to an important Frankish family at an uncertain date around 582. In his younger years he was called to the Merovingian court of king Theudebert II (595-612) of Austrasia and sent to serve as dux at the Schelde. Later he became bishop of Metz. During his career he was attracted to religious life, and he retired to become a monk. After his death he was canonized as a saint. In French he is also known as Arnoul or Arnoulf. Near Nancy. He was also of, Metz, Moselle, France (Metz is on the Moselle River; about 175 miles east of Paris. ).